For Leonora, going to a hen party isn’t her cup of tea, but when an old friend from a decade prior is getting married, she’s on the receiving end of an invite to a cabin in the woods to celebrate Clare’s last days as a single girl. If “cabin in the woods” isn’t an indicator that something will go wrong, then I have nothing else for you. Reluctantly, Nora goes. She carpools with Nina, another blast from way past, and shows up in Northumberland already wishing she’d declined. Also in attendance is Flo, Clare’s obsessive, insecure bestie, Melanie, the new mom who can’t stop talking about her six-month-old, and Tom, the token gay guy. When Clare shows up for her bachelorette weekend, Nora is reminded of all the reasons why their friendship fell part ten years ago. It’s made worse when she learns that Clare is marrying James – Nora’s old high school sweetheart. If it sounds like I’ve described a novel that should be on the Chick Lit shelf instead of in the thriller section, you’re not entirely wrong. There is serious girl-boy drama among this crew of “friends.” There is bickering and snide remarks, jealousy and even a turn on the Ouija board. However, once someone is murdered, sh*t is about to go down. 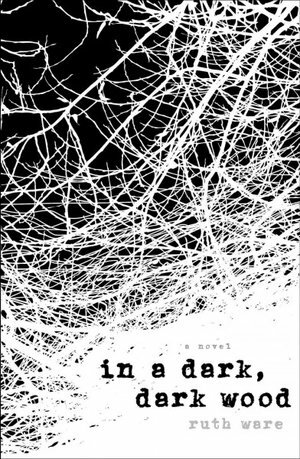 In a Dark, Dark Wood is a thriller at its core. There is suspense and speculation. There is chasing in the woods and inclement snowy weather. However, I have to disagree with the front cover quote (on the edition I read) from Reese Witherspoon that said, “Prepare to be scared… really scared!” No, I wasn’t scared. I had a couple of theories on who the real criminal was and one of them panned out as true. But don’t let this deter you. I read this book in three days because I couldn’t put it down. I read at every free moment I had, and I highly recommend it if you’re looking for this level of thrill. For a whodunit, it works.